Let's analyze the influence of the players' usage on their performance. Welcome back to Corner Stats! Today I want to analyze the players’usage and the influence of that on their performance. I want to thank my friend and podcast mate Paolo who suggested the topic to me. Here we go! The minutes played sometimes are not considered in the analysis. However, the usage heavily affects the number of contributions a player can make or not; this negligence is in some cases mitigated with the use of advanced stats, which already take into account the average players’usage. To confirm the importance of taking into account the playing time, there are the stats per 36 minutes: the contributions per game are divided for the minutes played and then multiplied by 36. 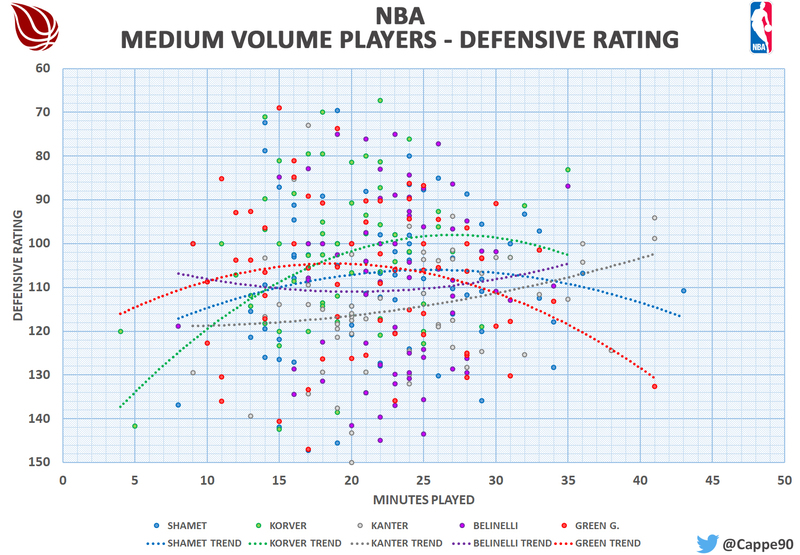 In this way, the points, the assists, the rebounds of all the players are based on the same playing time. In my opinion, however, this system is as simple as misleading: in fact, we assume a linear distribution of the contributions, that is not always true. So let’s observe the distribution of three common advanced statistics with respect to the minutes played by all NBA players with a minimum number (10) of games played: Offensive Rating, Defensive Rating, and PER. 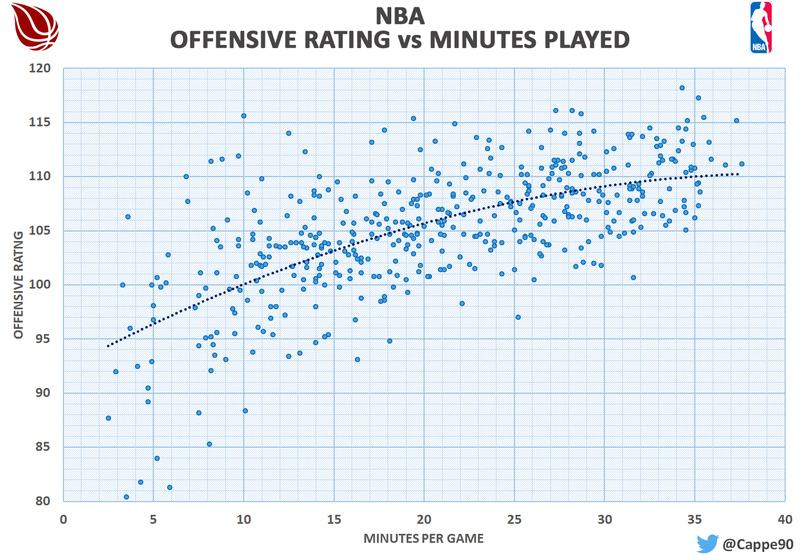 In this first chart, I intersected the minutes per game with the Offensive Rating. 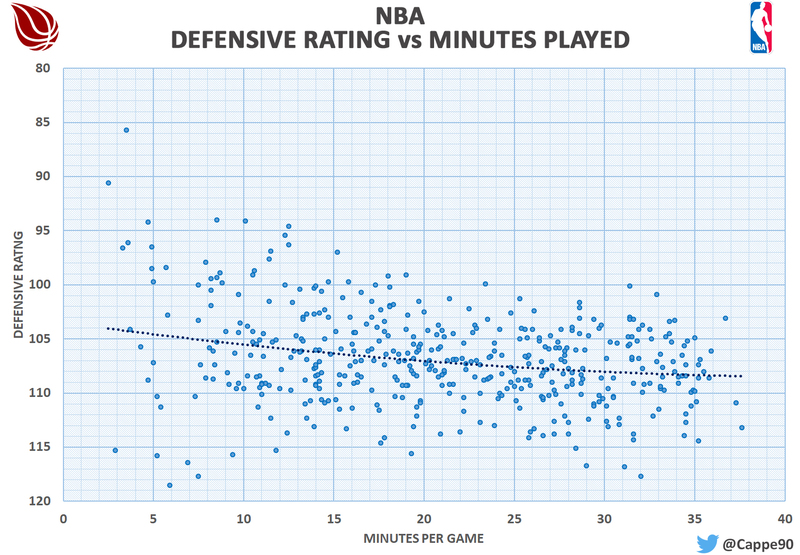 The distribution per 100 possessions allows this statistic to partially avoid the dependence on the time, but however the formulas need that data; consequently, the distribution of the chart shows that the greater is the player’s usage, the greater his offensive rating will tend to be. Basically, it can be assumed that the more time you have available, the more chance you have to contribute to the offensive purpose of your team. 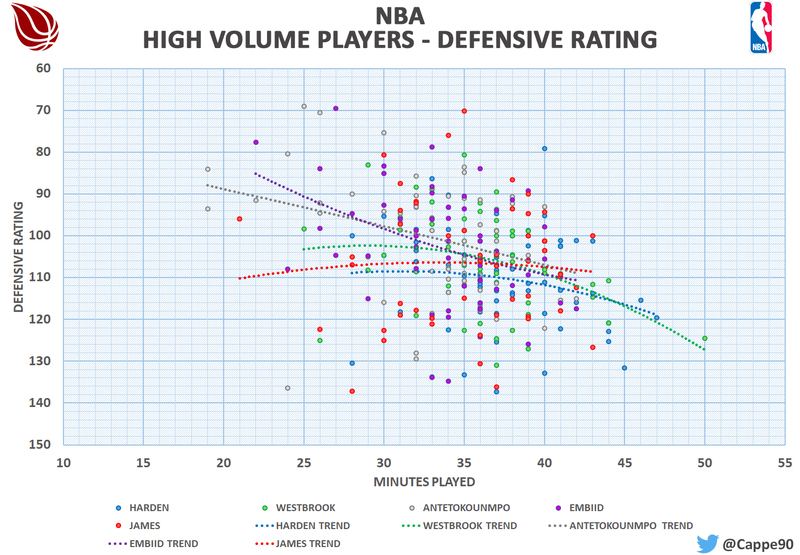 The second chart shows the Defensive Rating: in this case, the trend is the reverse of the previous one. 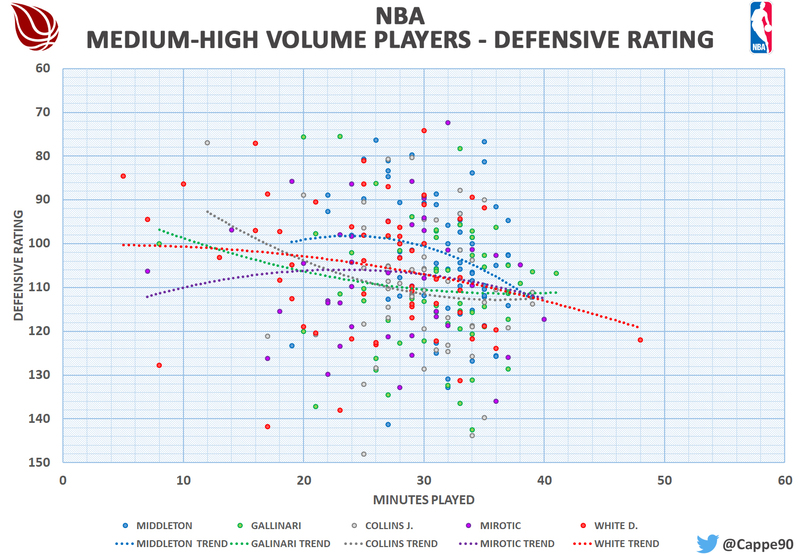 In my opinion, there are two fundamental factors that influence this trend: the accumulated tiredness by high-minutes players negatively affects their defensive efficiency. Furthermore, defensive specialists never play so much, because they are only used in some situations. Lastly, the PER: this statistic obviously takes into account the players’minutes per game, but clearly, the point density and the trend line suggest that it is easier to obtain high PER with medium/high playing time. The three charts show a clear tendency: by increasing minutes, offensive statistics tend to grow up, while defensive statistics tend to fall down. This in general, of course: I took into account all the players, but there are different types of players. 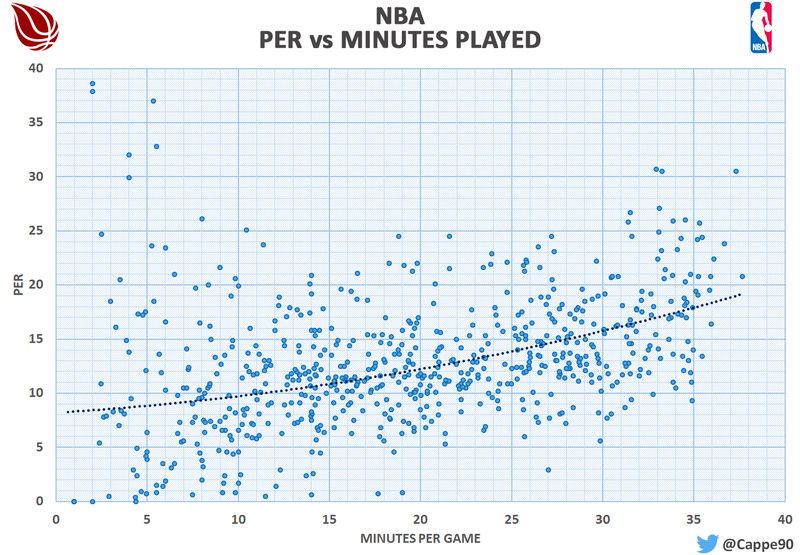 We have the stars that play many minutes and have a big amount of possessions. Then we have the supporting players who call fewer possessions of stars but play quite the same as the first category. Lastly, there are players from the bench who are used 20/25 minutes and who almost always have particular tasks (shooters or defensive specialists). 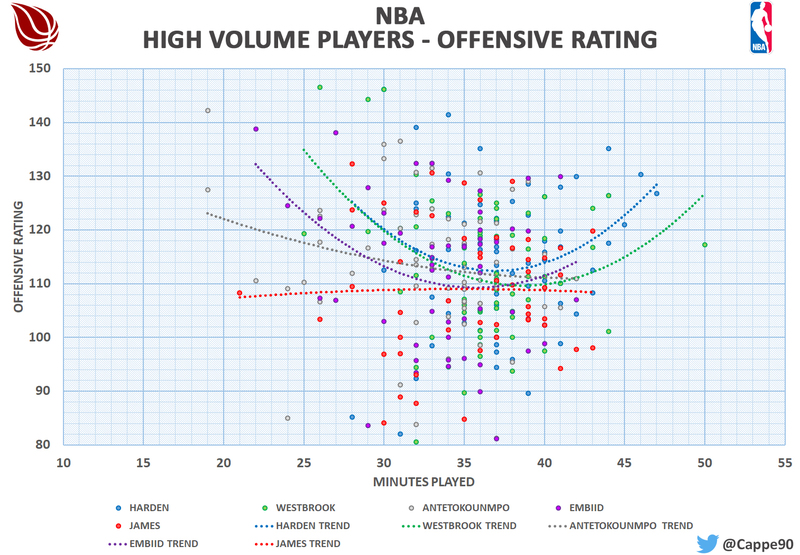 I select five players for each of these categories in order to observe the various trend. For the first category (stars) I selected Harden (37.6, 115.2, 110.9), Giannis (32.9, 113.5, 100.9), Lebron (35.3, 108.6, 106.9), Embiid (33.9, 111.4, 103.3), and Westbrook (35.9, 111.6, 106.1). Inside the parenthesis, you can find the minutes per game, the Offensive Rating, and the Defensive Rating. 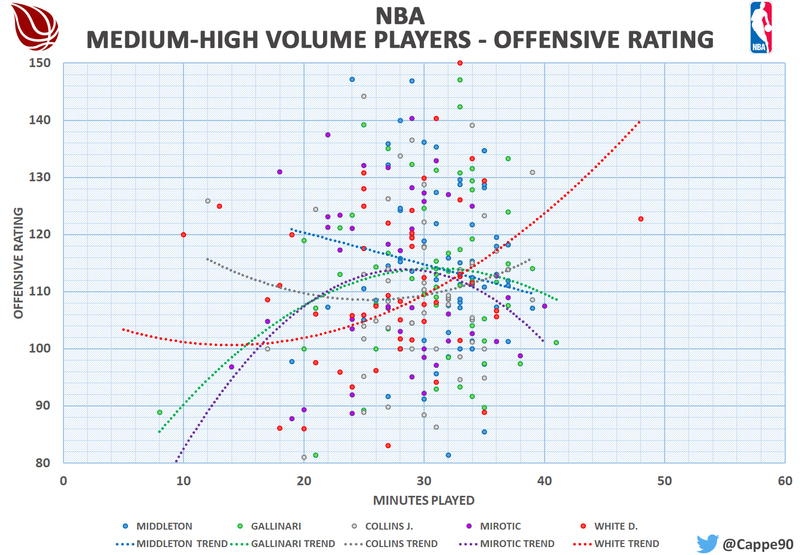 Apart from Lebron’s exception, all the dotted lines show a very similar trend: the Offensive Rating values are higher below the average of minutes played, then they are reduced around the average playing time (settling around the average value of their Offensive Rating) and finally return to higher levels with above-average minutes played. This trend can be explained by several factors: the low usage peaks are probably due to excellent performance in the first part of the game, which makes possible to increase garbage time. On the contrary, in clutch games, the stars play more and perform above average to get a positive result. From the defensive point of view, on the other hand, trends reflect what has been said previously. Let us now move on to the second group, that of the supporting players. I selected Middleton (31.4, 113.6, 103.2), Gallinari (30.5, 112.6, 110.3), White Derrick (25.8, 109.2, 106.5), Collins (29.7, 110.2, 110.8), and Mirotic (27.1, 110.9, 107.5). Wow, Collins and White! They are the only two selected players that show a trend similar to the stars one (White in particular). 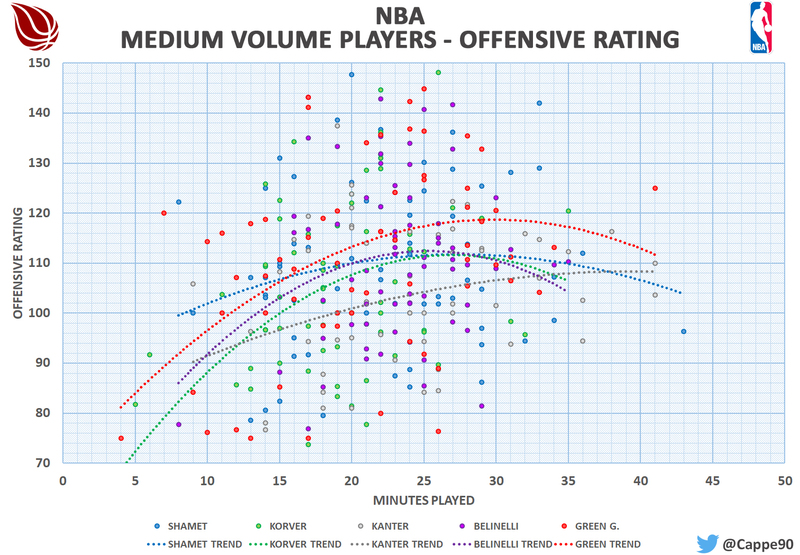 The other players instead show a reverse trend to the one just mentioned: the Offensive Ratings increase until they reach the peak around the average playing time, then decrease. Once again, the defense always shows the same trend. Finally, the last group: Shamet (22.3, 109.9, 107.3), Belinelli (23.1, 110.7, 110), Korver (19.1, 105.7, 102.8), Kanter (23.9, 103.6, 113), and Gerald Green (20.6, 113.3, 107.9). The trend already seen with the second group is back, but in this case, the peak is reached around a time that is higher than the average usage: in other words, they are players who are used more in the games in which they go “in the zone”. And finally for the defensive phase, we have a different trend than usual: in this case, they look more like offensive trends. This seems to be related to the offensive performance; when bench players play well on the offensive side, they play more time and they also increase their defensive abilities. In conclusion, the charts show some reasons behind players’usage: with respect to their role and function, they show a different trend in the two advanced statistics used for the analysis. Through the last couple of charts, we understand why the specialists, even in the most positive nights, are not exploited more than they should: besides a certain threshold they tend to decrease their efficiency.